Falmouth beaches are among the nicest in the Upper Cape Cod region. The Bay and Sound waters are wonderful for families - warmer than the Atlantic Ocean (many, many degrees warmer! ), and normally quite calm. Parking Fees: From mid-June to mid-September, non-residents may park at some Falmouth MA beaches for a daily fee, paid at the gate. At other beaches, a temporary resident sticker is required. Stickers may be purchased at Ellen T. Mitchell Bath House, 56 Surf Drive. Call (508) 548-8623 for more info. This icon indicates that the beach is accessible to people with disabilities via a boardwalk, ramp, Mobi-Mat, or beach wheelchair. Old Silver is the most popular of all Falmouth beaches, with good reason. It's long and wide, with beautifully clear water and amazing views. There's a really pretty little inlet that runs from the Bay to a saltmarsh on the other side of the road. That's my favorite place to get away from the crowd and hang out. All in all, this is a wonderful beach for all ages. Amenities: Lifeguard, food concessions, restroom and shower facilities, picnic area. Mobi wheelchairs available. Parking: Lots fill up early during the summer, sometimes as early as 9:15 a.m. So plan to get there early and stay a while. Daily fee ($20) or sticker required. Note: Watch out for strong currents, especially around the times of high tide, and particularly in the area near the jetty. Chapoquoit is a favorite with many "locals" looking to get away from it all. It's situated on a spit of land that pokes out into Buzzards Bay, giving it a somewhat secluded feel. The beach is long and a bit narrow, with a wide open view of the Bay. Amenities: Lifeguard, food concession, restrooms. Stairway leads to the beach. Parking: Large lot. Sticker required. 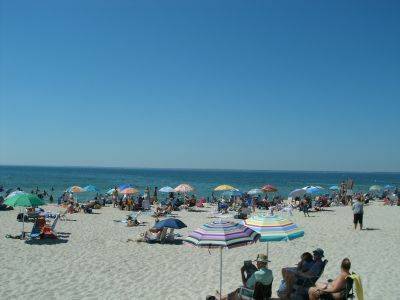 Surf Drive Beach is located just a few minutes drive or bike ride from the center of Falmouth Village. And a gorgeous drive it is, with amazing views of Vineyard Sound and Martha's Vineyard! Surf Drive Beach is long and roomy, with gentle waves. There's a small inlet just north of the beach area that's great for little kids to explore. The snack bar at Surf Drive is one of the best anywhere. It's not just the usual burgers, dogs and nachos at this snack bar. Try a grilled chicken sandwich and a fruit smoothie for a yummy and healthy lunch at a very reasonable price. Amenities: Lifeguard, snack bar, restroom and shower facilities. Beach wheelchair available. Parking: Large lot. Daily fee ($15) or sticker required. Menauhant is one of the more secluded-feeling Falmouth beaches, set in a quiet East Falmouth neighborhood. The warmer water, soft wave action and long, narrow stretch of sand are perfect for a laid-back day watching the wildlife, picking up shells, or just hanging out on the beach. Amenities: Lifeguard, ice cream truck, restroom facilities. Beach wheel chair available. Parking: Good sized parking area. Daily fee ($10) or sticker required. This is a great beach for families with teens, for young adults, and for anyone who's looking for Falmouth beaches where there's plenty of activity. For everyone else, Falmouth Heights Beach is also long enough that you'll find room to get away from it all when you're ready to enjoy the warm waters and soft sand in a more serene mode. Location: Off Falmouth Heights Road in Falmouth Heights.